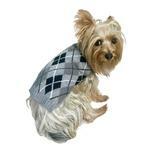 Give your pup a classic preppy style with the Edinborough Argyle Mock Turtleneck Dog Sweater in Grey by The Dog Squad. All the designers are showing Argyle on the runway this year and your furbaby can match your chic look with the Dog Squad’s Edinborough Argyle Mockneck. Soft and cozy your baby will be fashionable all winter long. The customer service at Baxterboo is the most outstanding customer service I've ever received.